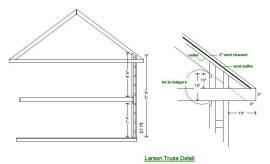 The following description and discussion of the Larsen Truss energy efficient wall design were taken from a post by Robert Riversong on the Taunton Fine Homebuilding Breaktime forum. This material is provided with the blessing of Robert, who has reviewed it. Thanks very much to Robert for providing this detailed description of his variation on the Larsen Truss design. It is obvious that a lot of thought and experience have gone into developing it. If you are looking for a combination of low cost, energy efficiency and sustainability, this looks like a very good candidate. Yestermorrow Design/Build School in Warren VT.
And, a new course this summer called "Thinking Like a Mountain: Sustainability From the Ground Up", which will be a technical, philosophical, and experiential exploration into the full spectrum of what it means to build - and live - sustainably. Is anyone else building with a Larsen Truss or modified Larsen Truss super-insulated wall system? 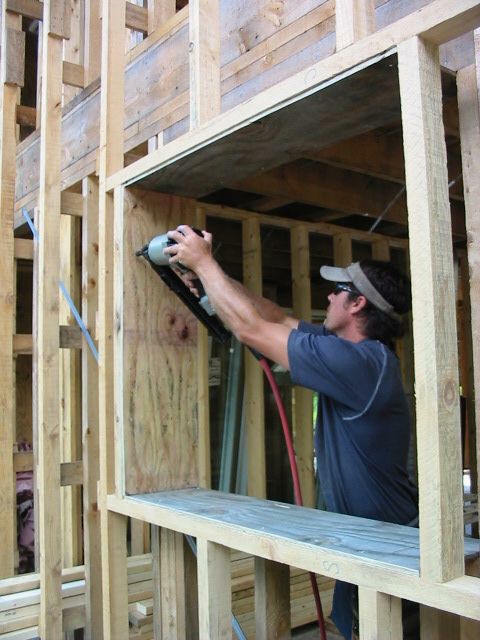 I've been using and modifying this system for 20 years and can build a 12" thick wall (R-40+) with no more lumber than a conventional 2x6 house, in part because I eliminate exterior wall sheathing and use t-braces and full 3/4" drop siding over housewrap. 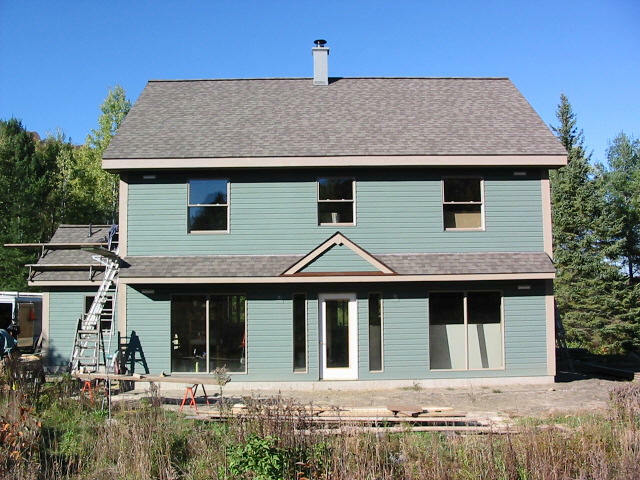 The Vermont Energy Code requires an index of 85 (15% more efficient than an IECC house) and Energy Star requires an index of 80 for northern climate zones 6-8. 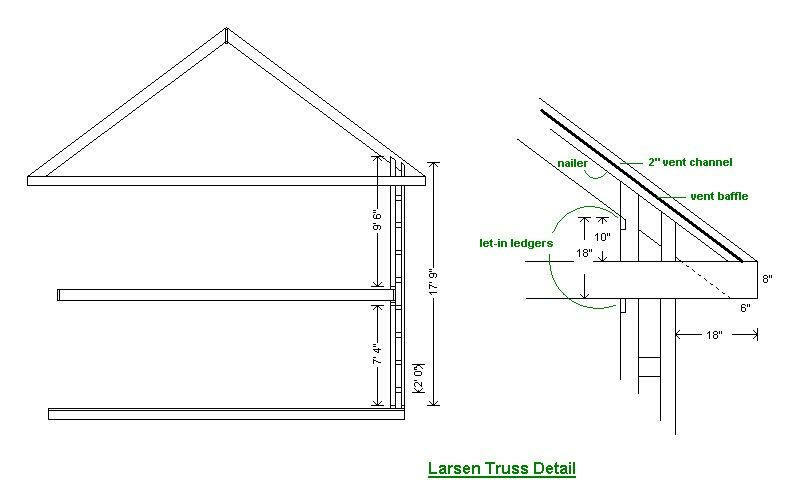 So a HERS index of 46 means this modified Larsen truss home is expected to consume 64% less energy than an IECC house, and 34% less than a threshold Energy Star home. 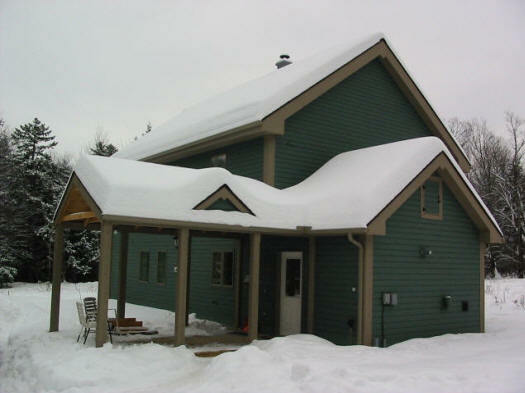 According to the VT Energy Star administrator, this house tested in the top 5% of Vermont's Energy Star homes. Do you do anything to segregate the wall bays from each other? I find it hard to get a good dense cellulose pack when the cavities have too much crosstalk.? 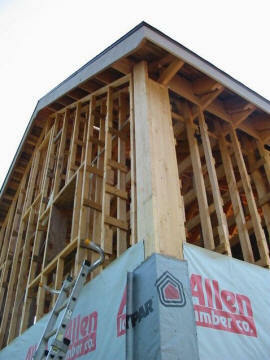 No, I've considered stapling fiber mesh to the trusses, but that's a lot of work and it would interfere with utilities. Instead, I've developed techniques to make it work. For one-storey walls, I might leave a 6" horizontal gap (first covered with mesh) between upper and lower sheets of drywall. Through that, I can reach the hose and my arm if necessary and direct the cellulose downward, laterally, and then upward. I might also reblow with a smaller and stiffer hose (1-1/2") that I can jamb down into the first blow to increase the density. Then I fill the gap with 3/8 drywall for a flat seam. Then I will hang the second floor ceiling and walls, and blow down from the attic (which is accessed through a hayloft door in the gable above the insulated envelope - no penetrations in my ceilings, not even ceiling lights). 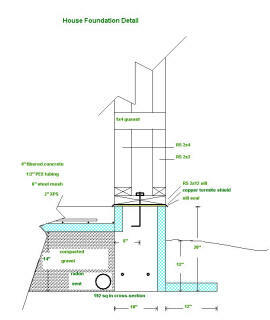 And finally I'll do an open blow in the attic, filling the space at least twice as deep as the joists up to storey poles which indicate proper and uniform depth. 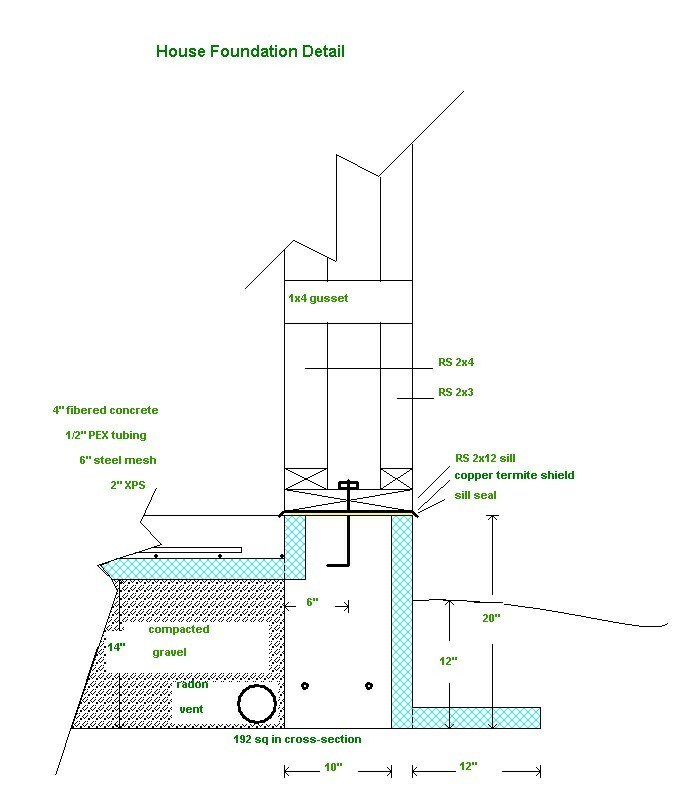 How do you prevent settling of the cells in those 20'+ walls?" The insulated wall cavity is actually 18' in total height, including the attic insulation above it. 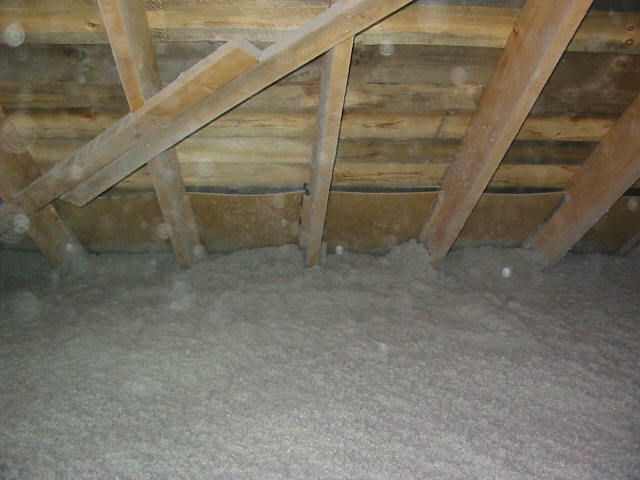 The initial settled density (by gravity) of blown cellulose in an attic is 1.4 lbs/cf. While it's difficult to get full dense pack density at the top of a wall section (though I assist this by stuffing empty cellulose bags into the wall cavity to create some backpressure), it will still be considerably more than the gravity density of 1.4 lbs/cf and will always be attempting to expand. 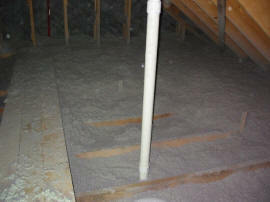 Even if there were a small amount of settling in the wall cavity, I have 20" of cellulose in the attic on top of the wall. 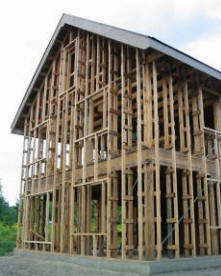 Have you looked into a wall after few months or a year to insure that no settling has occurred? I haven't had that opportunity, but I'm completely confident in the ability of dense pack cellulose to resist settling and this has been confirmed to me by the technical manager of Cell Tech, who is a friend and fellow teacher of superinsulation. So, no sheathing? That is one thing that would take some getting used to (for me). Seems like you would need to be careful installing the housewrap. Can other siding types be used with your system? 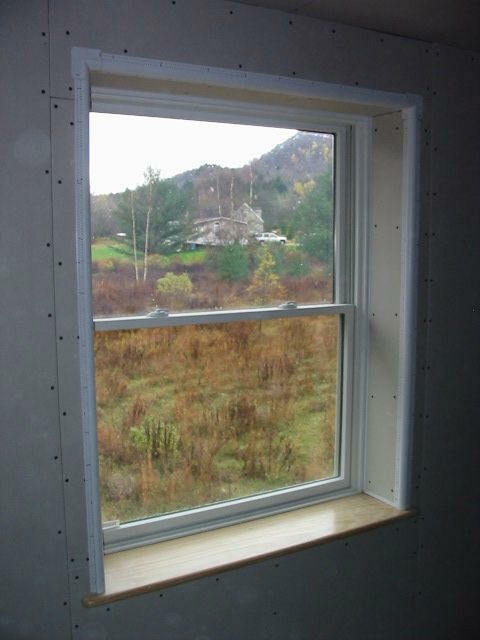 How do your windows go on with no sheathing? No casing? Yeah, it takes a little care and a ladder with a reversed stand-off, but you can also reach the housewrap from inside the house as it's being applied. 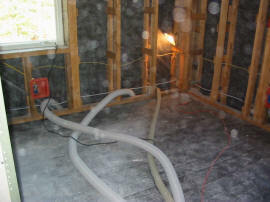 Do you use a vapor barrier on the warm-in-winter side of the wall when you insulate with cellulose?. I haven't used vapor barriers for 20 years. On new construction, there's really no need and they can even be counterproductive by concentrating moisture problems at weaknesses in the VB. 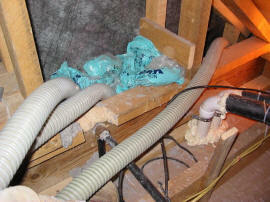 As far as firestops, I've used this system for three homes in Massachusetts where codes are strict and strictly enforced, but three different building inspectors had no problem with a "balloon-framed" wall system that was full of dense-pack cellulose, which is a better firestop than solid wood blocking. What are you blowing for attic depth?" 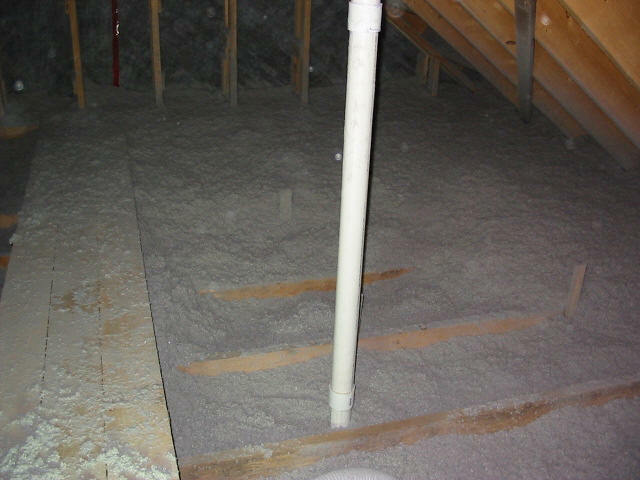 I place 18"- 20" of cellulose in the attic, for an actual R-value of 61.2 to 68 (assuming R-3.4 per inch at 1.4 lbs/cf settled density). You don't use an HRV (Heat Recovery Ventilator)? I don't use them, because I try to keep my houses as low-tech as possible to reduce initial and operating costs and long-term maintenance. In addition, because my homes include a woodstove, which is an exhaust fan, they will ventilate even during a power outage - in other words, they don't require "artificial respiration". How do you deal with green lumber (which I'm assuming is the rough sawn stuff ) shrinking? Ring shank nails? I use 20d galvanized common nails for framing - great holding power, but it means hand nailing. Also, how's the consistency of the rough sawn lumbers dimensions? In this case, since I got my lumber from a computerized bandsaw mill, it was remarkably accurate and consistent. However, with a double wall system, only one plane needs to be lined up. The same is true for the roof and ceiling. For inside partitions, other than the center load-bearing wall, I use KD lumber. What is your approach to windows and doors on these superinsulated houses ?? I go with steel or fiberglass insulated entry doors with lowE/argon lights. Steel doors have the advantage of an available magnetic weatherstrip (like a refrigerator door) which seals better than bulb weatherstrip, and adjustable oak/aluminum thresholds with thermal breaks. Can you recommend some good reading on this stuff? I wish I could, but I don't think there's been a book on the subject published since the 80s (following is a list). And there isn't even a website that I can find that covers the spectrum of superinsulation options.